Constructed in the 1870's The Old Dubbo Gaol served as a penal institution until 1966. Fully restored to its original condition, the gaol was re-opened as an historic and educational tourist attraction in 1974. The Gaol is home to Australia's 3rd largest collection of taking/animated models which give a realistic and fascinating insight into prison life. The gaol boasts a large display of historical artefacts including an original set of gallows and a full hangman's kit. Adults $6, pensioner/ senior citizens/ university and TAFE students $5/ children (kindergarten - yr 12) $3; under school age free. 12 ropes of varying lengths, each with a leather sheathed noose passing through a large brass eye at the end of rope; ankle straps; weight for stretching ropes; block & tackle for raising trap door; metal trunk. 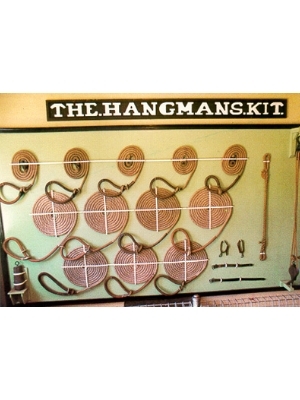 Received from Darlinghurst Gaol in Sydney believed to be the only full hangman's kit on public display in Australia. Also believed to be one of only two full hangman's kits in Australia. Constructed of Cypress Pine with a hardwood hanging beam, the gallows are about 16ft high with a base 12 ft x 9ft. Eight men were executed on the gallows between 1877 and 1904. 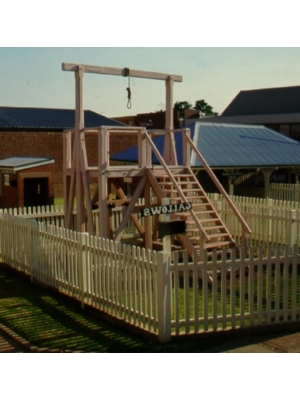 When not in use, the gallows were disassembled and stored underneath the nearby Court House. Padded x 1, Solitary x2, Condemned x 1. Solitary confinement cells:15 cm of soil in ceiling to muffle external sounds, 2 doors to provide a light trap, hinged solid shutter on highlight window opening. Padded cell: with padded leather panels. Condemned cell: with internal grill wall. About 3250mm sq; walls about 2900 mm high. Hardwood walls & floor with an iron roof. The cell was received from Pilliga Police Station in 1995. It has little modifications made to it. The cell is a good example of its type which was used at remote small town/villages in the early 1900's.